Spokesman-Review: So what have you put your stamp on here in this first year? Patrick Chun: Outside of this office? The reality itself is, I think what happened this fall is indicative of really a good program that I was fortunate to take over. The success of this fall was one of the great joys of just being a part of Washington State. S-R: What have you learned here in this year? What’s different about this place than you might have expected? 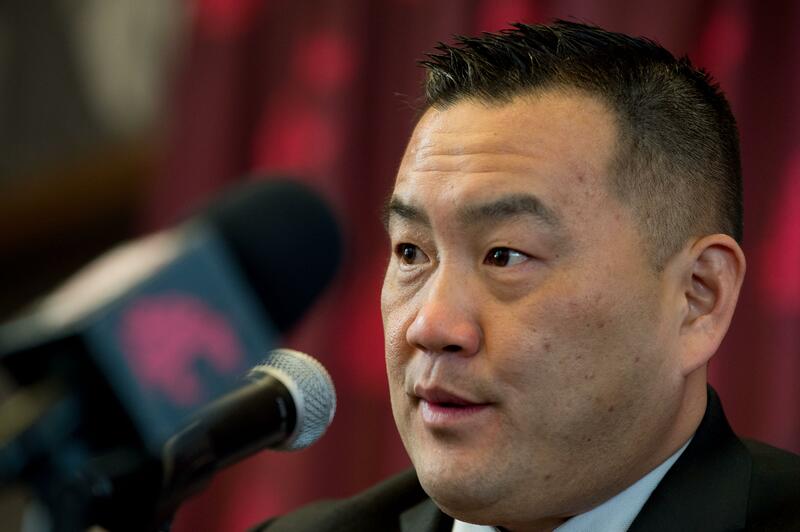 Chun: When I started last year, they had me do the Night with Cougar Football, and when you study this place, from the outside looking in, I’d tell people you know nationally this is the reputation of the Cougs – whether the Cougs know it or not – in my estimation it’s one of the top dozen schools in the country in terms of the affinity of the alums toward the institution. It’s one of those places that when you walk around an airport with a logo you get a “Go Cougs.” I was just at the NCAA Convention and my wife was with me because she wanted to go see some friends in Florida and we’re in the Orlando airport and we get a “Go Cougs.” After being here for a year and seeing the fever firsthand, watching what happened on GameDay, seeing how we travel on the road and meeting with people one on one, I’d argue there’s almost no place like this in the country. Simply because the loyalty and love Cougs have for Washington State is really touching. In today’s day and age where there’s a lot of things that can take your attention away, the loyalty Cougs have is really incredible and it’s always going to be what our greatest strength is. We have Cougs that have been with us through the good and the bad and fortunately for now, people may interpret this as part of the good years. But this is a place where people don’t jump off the bandwagon. They stay more firm, more loyal. There’s a grit to being a Coug. S-R: But there’s an interesting there. You’re challenged in terms of resources and alumni volume and what the level of giving has been. Is some of that attitude because you’re so challenged on that end? Chun: There’s something to the experience you have here in Pullman as a student. It’s a true college experience. So even compared to my college experience, which I thought was a true college experience, going to a big, land-grant school, making a lot of friends but still in a major city – or at least in the Midwest a major city – here it’s a true college town. Even in the time I’ve been here, there’s this feeling that people take care of each other inside this cozy college town. As a newcomer here, we could go out of town for a week and we’d have three different neighbors know we’re going out of town and offer to take out our garbage and check our mail. From a student standpoint, when tragedy hits or adversity hits, this is a place that rallies together relatively quickly for the greater good. When you choose to come here as a student, you might be wired a little differently. You’re choosing to be a part of a really unique college experience that only places like Pullman – especially on the West Coast – can offer. S-R: Your hire came at a time of unthinkable tragedy on campus, in the wake of the suicide of Tyler Hilinski. As a virtual stranger in that circumstance, how can you be a comfort and leader? Chun: There’s nothing that can prepare you for that type of tragedy and the reality is, you would hope that no other school has to go through that. Then you understand because it’s a real time issue nationally that specific to Washington State, there have been suicides before Tyler’s passing and there have been suicides after, sadly. Then you come to learn it’s the second-leading cause of death for college-aged kids and those numbers are rising. The immediate responsibility is always your current student-athletes, coaches and staff. The impact – and I think the term is postvention – after something traumatic like that, and work with our experts. Fortunately for me coming in, our sports medicine team led by Dr. Henry, the counselors on campus, Mary Jo Gonzalez and her staff, our VP, this campus was in my estimation prepared to handle a situation of that magnitude. Then as an outsider you see the beauty of Washington State – the alums, the state even regardless of where you went to school kind of wrap its arms around Washington State University. Then you see how our student-athletes react, our campus reacts. We recognize the platform we have as far as bringing more awareness for suicide prevention and mental health awareness. We all need to work harder to de-stigmatize mental health services and challenges. With anything you have to try to find the good in any type of tragedy. This one was unique because this is a close-knit group of student-athletes. I came here without relationships with anyone on campus, so then you’re trying to get to a solution – but you realize this is a layered thing and you have to rely on the experts. I’m proud of what our team and student-athletes have done. They have this “strength is asking for help” mantra they’ve been going around with and we’ve been very intentional about creating more programming. We have this “Behind Happy Faces” and “Step Up” that our student-athletes are trained on, and they’re going to start training high schools around here as well. S-R: These initiatives on campus and now conference-wide. Why has this been a neglected area? Can Washington State athletics be a leader in the cause? Chun: The more you learn about suicide, what the JED Foundation advises you is, you don’t look for the reasons why. You just have to move forward and try to create an environment in which you’re doing something to prevent that from happening in the future. Our university is well equipped in terms of resources available. There’s going to be an increase just because the world is changing, young people are changing. The coping skills and resiliency of high school kids as technology and devices impact them is changing rapidly. This is a societal issue. I do believe Washington State and the Pac-12 will continue to take a leadership role. If circumstances dictated that we’re the school that’s called to do this, so be it. It’s also reassuring that this isn’t a one-person initiative. This is more driven by our students and how much they care. This is something everyone understands that this is something we as a society aren’t doing right because the numbers of suicides are increasing, so let’s rethink this thing and figure out what we can do. S-R: The Hilinski family was disappointed with some aspects of the school’s response and tribute to Tyler’s suicide. Have you reached out to the family at all recently to mend fences? Chun: We will have our critics and I recognize that in what we did in postvention. But I would argue a lot of places don’t have our responsibility. In athletics specifically, we have 450-500 student-athletes that we’re responsible for and every single one of them were impacted differently. We have to be versatile enough to handle 450 different needs. Our focus has been what’s been best for our student-athletes and students on this campus. It’s awesome – I don’t know what the right word is – to see how the Hilinskis have reacted. It’s powerful stuff. Nobody wants to play the what-if game as to being in their shoes. But to see how they’re using this and trying to make a different, is a message we’re hearing at Washington State. There’s not a day that goes by here where we haven’t thought about Tyler and what we’re doing for our student-athletes. It’s that much of a priority for us at Washington State. S-R: What impact did you see from football’s success, whether in fund-raising or day-to-day operations? Chun: I’ve been around the business long enough to know that nothing happens overnight. For me to come in here and end up working for what I believe is the best president in the country, but also to be paired up with what I’d argue is a Hall of Fame football coach and to see the way he operates and builds and stewards a winning culture, how he communicates with his team and develops assistant coaches. No matter what, everything is process driven. To see behind the curtain, or as much as you can in one season, to see what Coach Leach does in terms of building this environment. On the outside looking in, we’re not resourced like other schools. Our rivals and opponents will tell everyone we have all these challenges geographically in recruiting people here and then you see what the reality is. We have a head coach who can build a winning program, who knows how to identify players. You look at all the coaches who are successful here, they all can identify young people who can thrive here athletically, academically and socially. No matter if you’re trying to attract kids to LA, Phoenix or Pullman, you have to find kids that can excel in those environments. Fast forward, you see the results of that process: in contention for the CFP, in contention to win the Pac-12, GameDay showing up here. Then you see the impact football has. It allows people to cheer at their loudest pitches how much they love Washington State. Waving that flag means something. And the most important thing it should impact is admissions and applications. We did a study with the impact of GameDay from the minute Kirk Herbstreit sent out the tweet to the day after the game and I think there were more than 400 million impressions. To be trending on social media that week in the competitive space we’re in is incredible. Social media is currency for high school kids. We’re doing our jobs in promoting the university from an advertising standpoint, from a giving standpoint. We had our best year ever in the Cougar Athletic Fund. We were able to fund raise for this baseball project and get 100 percent of the commitments needed. Momentum is the best gift an athletic director could ask for in year one. We’re having success academically – we had our highest GPA in school history. And then what football, volleyball, soccer and cross country did. We’ve had minimal to zero off the field issues since I’ve been here. We have all this positive momentum heading into next year. And it’s important that we keep building on through fund-raising for us specifically because a lot of our revenue streams are fixed. The size of our stadium is fixed. Until the next negotiations, our Pac-12 distributions are fixed. So fund-raising and corporate sponsorships are where we’re going to make the biggest dent. And I’d argue we’ve never been hotter. S-R: How do you build from football’s success? Going back to the early 2000s when the school had three 10-win seasons, it didn’t capitalize – facilities didn’t get built. You have the facilities now, or mostly. How do you build on it, especially with a finite stadium size? Chun: Coach Price has let me pick his brain on what he did in a different era to build a program. Some things are timeless – recruiting high-character student-athletes, hiring great assistant coaches. But also what coach Price did, identify a quarterback early, develop that quarterback and then start over again. What I’ve told Cougs is, that worked then but it’s harder to do now, if not impossible. Building is a lot harder than sustaining in today’s environment and how competitive it is. For us, the world has changed. There is a reinvestment piece that has to constantly happen in all your sports. I do recognize, we are winning some significant recruiting wars against our peers in the Pac-12. We have to keep reinvesting. Baseball is our real time example right now. When the Martin Stadium renovation, that kind of triggered everything – hiring a Hall of Fame caliber coach, building the operations center, next is the indoor practice facility. That’s kind of the last piece of the puzzle. I take a lot of pride and a little awe that on a Friday night before a home football game if we happen to be home in soccer or volleyball, it’s standing room only. That’s a pretty special thing, but it takes reinvestment. Baseball fell behind. The history of that program doesn’t match the facility it’s in and we have to redo that. In football, we have to get an indoor practice field built. And even from a human standpoint, locking coach Leach in as long as we can. He wanted to lock in his defensive coordinator for the near term, so we were able to do that. You have to reinvest, and then it’s up to us to grow the other revenue streams. S-R: Given the football staff turnover of the previous year, and though it slowed down this season, how do you keep those people? Chun: Continuity helps. You look at the most stable programs in the country, the most important stability is with your president, AD and football coach. And the good thing here is, we are stable from a presidential standpoint, Kirk is renown nationally for his understanding and advocacy of college athletics. But from a coaching standpoint, the market is always going to be in favor of successful, winning coaches. You could argue Mike’s coaching tree is top five in the country, maybe top three. Then you know that one of the great attributes of Mike Leach is the ability to identify and develop assistant coaches. We’re not naïve to the ebb and flow. We had big turnover last year, we had minimal turnover this year, we may have more next year. When you work for Mike Leach, opportunities are going to come. But what he typically does is recreate the wheel for that position or improves on it. S-R: Other than the extra year and salary, did the parameters of Mike’s contract change at all? Chun: We actually did this the first week of December. I’m appreciative of Mike and how much he communicates. He made it clear to me and the president early on that he’s happy here. When you have a long esteemed career like Mike and as self-aware as he is, I think that’s to the benefit of Washington State. He knows what he has here and the heart and soul he put into this thing to build it. And to have a year when, what I was told, the team was relatively young and it was supposed to be something of a bridge year for us, knowing that we had one of the best years in school history, I think he knows, he’s put a lot of work into and there are some heights were within reach of now. S-R: Why was GameDay such a big deal here? It’s not that way at other college football venues – they’re always greeted well, but here it was off the charts. Why did it mean so much to them? Chun: You talk to the GameDay guys and they’ll tell you it was an all-timer for them. They sent me a copy of the show after, starting 30 seconds before it went live on air. So you hear the producer yell “30 seconds!” and then there’s a countdown clock. They wanted to get the shot of Tom Pounds and the flag. Then it goes black – and I’ve used it in some presentations and I tell everyone, when it goes black and Rece Davis does that opening which every Coug will get chills from to the end of the time, that was the moment where the whole world was about to discover everything Washington State felt about Washington State. It was the stage that amplified what being a Coug meant. I remember the Sunday, sitting in Shawn Deeds’ office, we were doing a conference call with them and they asked, ‘Do you think you’d have people who would greet the truck when they show up?” And I chuckled, saying, yeah, we could probably get some people – they want this thing bad here. And then seeing the eruption when the trucks came down and people lined up all the way from Spokane to here, it was incredible. That’s the one show that everyone goes to, and for whatever reason there’s an assumption that GameDay coming to your campus validates you as a football school – a big-time school, with enough fever that GameDay wants to be there. I knew we’d get a crowd. To get what the fire marshal estimated at 30,000? That was a shock. I came down here at 5:30 for the 6 a.m. start and you could hear it driving in. The line I like to use is that when Cougs do something, we do it differently. That manifested itself in GameDay. And sometimes when we do things differently, we do it better than anybody else. I hope Cougs embrace that and use GameDay to think, hey, we are different. S-R: Tough year on the field for the Pac-12, and off-the field with the focus on football operations and officiating. Are you confident the league has sorted out its football administration issues? Chun: I’m confident we’ve taken steps forward. We just had meetings last week in Orlando and the dialogue was healthy in the room. As a conference, everything has to start on your respective campuses and you take a lot of pride as an AD walking in and knowing the work our fall teams did. As a league, every school needs to do that – and in basketball, we recognize we need to be the solution and not the problem in getting both our men and women back on track. We have to get unified as a league. I believe we’ve taken steps forward. I believe we have great presidents that collectively all know the space we’re competing in is the most competitive space, period. For Washington State to be the best we can be, we need our league to be the best it can be. We are motivated to do our part to make sure the Pac-12 is a leader among Power 5 conferences. We have some work to get there. S-R: Larry Scott claims to have a transparent approach – not with the public, necessarily, but with league membership. Do you feel that’s accurate? Chun: I’m relatively new. Being here for a year, I’m comfortable with where I’m at today as far as understanding even after the replay issues in the fall, we probably spent maybe three-four hours on the replay process at a fall meeting. That type of transparency is appreciated. And those types of tough conversations among the Ads and Pac-12 replay officials and Larry was appreciated. In my year here, the issues that have come up, we’ve dealt with them. We’ve had some tough conversations which allow you to move forward. Anything prior to this year, it would probably be out of turn for me to speak about that. S-R: Is your football coach as comfortable as you are with the situation? Chun: (Laughing) You’d have to ask him. But I’ve probably been in more meetings than he has. The coaches won’t meet formally until May, so he hasn’t had the opportunities I’ve had. S-R: What about the ongoing issues with revenue at the conference level, and that the Pac-12 seems to be slipping further behind other Power 5 conferences? Chun: It’s important for Washington State, and for every school. All 12 schools need as much distribution as possible. None of us are in 100,000-seat stadiums at max capacity. There are schools in the Big 10 and SEC that can pull both levers where they get gate revenue at its highest level and conference distribution at its highest level. We are not that conference. We’re going to look at what other options there are with our network, at finding an equity partner and things of that nature. We also recognize this: as a league, in the interim, having content that is attractive to the networks is going to be a priority heading into the next negotiations. And that goes back to what our campus responsibilities are. We have to make sure football keeps growing, and with men’s and women’s basketball that we’re doing what we need to do field completive programs competing at the highest level. S-R: How do you feel about this possibility of an equity partner? Chun: No danger to take a look at it. We’re interested to see if this is a viable option, and if it isn’t, it isn’t. We have a bunch of new presidents and ADs, along with those who have been in place, that are going to take a different look at this. I know from last season, having a football team competing at the highest level that your play dictates everything. Having a quarterback in the Heisman discussion, your play dictates everything. But I recognize the fact that it would be great for everyone to get Pac-12 Network on greater distribution. When everyone is fighting tooth and nail to make sure Gardner Minshew gets the recognition he deserves and the football program is getting the exposure it deserves, having a network that doesn’t have the distribution of peer conference networks – those are things that are in the back of our mind. But the good thing is, we’re in a league that doesn’t really accept what the status quo is, that is willing to think differently. Being a part of the Pac-12 has to mean that you’re OK with being a little bit innovative – and a disrupter. It’s healthy for us to look at this and decide if it’s an opportunity to create more revenue and get more distribution. S-R: The budget plan you laid out last May with steps to retire your deficit, still on course? Chun: We’re tracking. We’re on course. Still have a lot work to do. We had a record year in fund-raising, but we’re going to have to have consecutive years of record fund-raising. We’ve had record numbers of corporate sponsorships, but we’re going to have to have record years back to back to back. But like I said, having momentum is the greatest gift our student-athletes gave this athletic program and capitalizing on that momentum is something we’re excited to do. It’s to be able to meet with donors and prospective corporate sponsors with them already understanding who the Cougs are and the positives surrounding the program. S-R: What progress have you made on things like naming rights? Chun: The key thing is that we have assets that we’re trying to match up with the appropriate corporate sponsor, and the one that’s been talked about the most is getting a partner to name the field. We’ve had dialogue with multiple companies. We’ve gone down long paths with a couple companies. I use the analogy that sometimes it feels like it’s fourth-and-goal, and getting it over that goal line isn’t as easy as people think it is. The nice thing is, talking with CEOs and outlining the value of Washington State, it’s no longer a long conversation because they understand it and it allows you to get right down to numbers on what the impact is to what their target markets are. We have some assets around the stadium and even the arena to find more corporate sponsors. We’ve retooled everything, too. We’ve turned over a quarter of our staff since I’ve arrived. We’re proud to say that over half of that staff are either women or ethnic minorities. We’re proud not only of the talent we’ve been able to attract to Washington State, but the diversity we’ve infused into our department. Part of that is our revenue side. We’ve had some opportunities to make some changes. Some people left for different opportunities; some people just didn’t fit in with what we’re trying to do. We retooled and restrategized what we’re doing in fund-raising and corporate sponsorships and as these new teammates come aboard and get acclimated, I think the ceiling will keep rising. S-R: How have you retooled? What’s the philosophy? Chun: Bill Moos did a wonderful job in terms of building the foundations of the Cougar Athletic Fund. Leveraging seat location with giving to the athletic department. Now we’ve got to go see these people. At the end of the day, people give to people. The person we hired worked at Ohio State and he understands we’re going to be externally faced and focused and we’re going to go see people. Internally we’re as good as any program in the country. Externally we have revenue challenges that have to be addressed. I don’t think there’s a magic formula to that. There never was. It’s still relationship driven. You have to go see people and build those relationships. S-R: What’s the status or progress on a student fee? That was part of your strategy. Chun: Right now, no movement. There’s a process in place for the students to move that forward. My focus this year has been to try and build a relationship with our students. I’m a big fan of our student body president and vice president, and spent some time with our ZZZU Crew president. We had coach Leach go speak to the ASWSU senate. I spoke to the senate. We’ve done things like give food to students who are first in line for football games. If I heard when I got here that athletics did not have a relationship, at least in year one our focus has been, all right, whether you guys recognize it or not, especially where we sit geographically, all of our marketing has to start with students. If we get students to come out to support our games, we will have an edge. Our students make a difference at games. This year was more about letting them know, we are going to build this thing inward out. But students are going to be our focal point in all our marketing. S-R: What about facility needs? If the indoor practice facility is the next one, how hard is it to generate funds for facilities when your debt on the current ones is so great? Chun: The good thing is, they’re done on different tracks. When it comes to giving, it’s almost impossible to get someone motivated to donated to something that’s already up. People want to give to the future, to progress. The indoor practice facility represents progress. I believe there is a group of Cougs and we’ve been in discussion with a bunch of them, that understand that this reinvestment has to happen in our football program. S-R: Thoughts on Gardner Minshew? Chun: I told Gardner, I’m so fired up to see what Gardner Minshew does after football. I believe he’s going to have a long career playing professionally. I think Cougs identified with Gardner so much because he’d been told what he couldn’t do his entire career, was undervalued for most of his career, and faced failure. But he never quit. Even when he had an opportunity to go to Alabama and maybe set himself up for a coaching career, something inside him said, you know, I’m not going to quit on my dreams of playing quarterback at the highest level. I think Gardner Minshew needed Washington State as much as Washington State needed Gardner Minshew. There’s something in our DNA, that grit, is able to flourish at Washington State. I don’t care what Gardner Minshew does in life, if somebody hires him after football, they’re going to get that guy who makes a difference in your company and makes everybody else better around him. Those people are great in theory, but hard to find. S-R: What are your concerns with the struggles of the men’s basketball program? Chun: Ernie Kent has been wonderful to work with. I’m one of the people who gets to see behind the curtain and he’s recruited a really good team that does the work academically, they get along really well. We all know the wins have to come. Ernie knows he has to win. The good news is, it’s still early February. Our record, I’m sure Ernie isn’t happy with it. He’s still got time to get this thing going this year. We need to get basketball moving forward. I’m comforted by the fact that I know the character of the kids he’s recruited. And you see the ceiling for these players – it’s a lot higher than what our record is. We’ve got to get going and Ernie knows that and we’ll see where we’re at at the end of the year. S-R: How will attendance, or lack of it, impact any decisions you make? Chun: Take everything else out of it, we’re taking a deep dive into what we’re doing in marketing basketball. As we retooled our external teams, we have begun the process, we want to look and feel different from an environment standpoint. We hired a new marketing director. We’re retooling our marketing staff. We have to figure out how to make students want to come back, and how to make it a fun environment and bring the energy back. I know this, Beasley is still the type of old-school barn that you don’t have to sell out to have a home court advantage. We’re going to take a look at what we’re doing in terms of game atmosphere, game presentation, marketing to students, faculty and staff. The theory is, if we make it fun, winning will happen over time because we know we have to win. There’s an entertainment piece to basketball. I look at the little things at games. I think our drumline introduction of the team is one of the most unique things in college basketball and brings a certain energy. I watched our dance and cheer team compete nationally and finish in the top 10 in multiple events. We have a bunch of pieces in place. Everything is going to start with getting college students out to support the basketball team. I know they want to see results, so the key is getting them to understand that can actually help us. When they show up, they make a difference. S-R: Why do you say you like the culture of the program? Chun: When do all student-athlete events, when I look in the front row, I see men’s basketball. We’ve had most of them over to our house. Being able to hang out with them, even for just a couple hours, and to see how much fun you have with those guys, how they interact with our kids and with each other. I get to see different layers of these teams. The next off-the-court issue I get with men’s basketball will be the first one I’ve gotten. I know culture doesn’t guarantee winning, but I also know if you don’t have a great culture you’re not going to win period. S-R: Beyond the indoor practice facility, what would be your facilities wish list? Chun: We’re going to focus on the indoor practice facility and then we’re going to shift focus to Bohler Gym. This building is going nowhere anytime soon. When they built it, I think they built it with the expectation it would be around for 500 years. We do some of the best work nationally, I believe, in strength and conditioning, academic counseling and nutrition. We just don’t look the part because this building has been piecemealed through the years. Big picture: we need to add some pieces to volleyball. We have some locker rooms that haven’t been updated in years. We have some service-oriented things, if we can redo their space, it sends a vibrant message to recruits and allows us to do more with our student-athletes. S-R: When you get feedback from athletes, what are their concerns? What do they say their needs are? Chun: I hear mostly positives. I do know when I talk with our Student-Athlete Advisory Council that we do need to figure out how to do more in the mental health space. I think everyone does. We added a fulltime clinical psychologist. It’s cool to see our student-athletes do some things themselves, campaigns to make sure they are part of the solution as well. They’re cognizant of what their needs are, but the also want to be part of the solution and not just coming in and telling me what the problems are. S-R: What do your coaches tell you their concerns are? Chun: We have a competitive group that’s all invested in being at Washington State. So it’s all about what can make Washington State better at their respective sports. You never get the sense it’s about them leveraging Washington State to get other opportunities. A lot of it is the community. By this fall, we’re going to unveil a strategic plan. We’ve just begun that process. That’s going to allow us to have a tangible plan that’s going to be designed the entire department to achieve some goals that hopefully are going to make us a little uncomfortable. We all want to win more Pac-12 championships, so we need to think a little differently. But also embrace who we are. Our uniqueness has to become our strength. It’s one thing to say we’re the underdog, but it’s also one thing to use that to defeat yourself. If we’re going to be an underdog, it’s going to be in the sense that we’re David against Goliath and at the end of the day, David trained with that slingshot his whole life so that when he stepped into the arena with Goliath it was a mismatch. He was more prepared. I’m OK with being the underdog as long as I know we’re preparing differently and if our one edge is the slingshot, we’re going to train harder than everyone. We have to figure out who we are and embrace what our strengths are and having that set us apart. We’re going to set some markers and we’re going to keep growing and developing our program. S-R: What do you get out of strategic plan? Chun: We’re going to take a deep dive into, one, what our mission is as a department, and two, identifying what our core values. The word family really means something to Washington State, at least to this program and the people who support our athletic department. It’s an exercise to figure out who we are, what our purpose is and let’s have a plan. Five years from now, we have to see a new indoor facility or at least be close to completion. We have to be well on our way to getting Bohler renovated. We have to have services and programs that evolve and adapt to our student-athletes’ needs. We have to help our coaches. I’ve always been of the belief you get better at coaching as years go on, but your ability to motivate and teach 18-to-22-year-olds is what gets coaches out of the business. Once you lose that ability to connect and motivate and teach, you become obsolete – even though you know more about the game. So we have to give our coaches the tools to be able to connect with college and high school kids to have them want to come play for us, and to help them achieve goals when they’re here. S-R: How have you gotten better at your job in this last year? Chun: This place fits me and my family well. Some of it is because our roots are Midwest and another is just how nice this community is. Having your family fit a place this seamlessly has allowed me to have a different level of focus on my job. On the other side, I grew up in an athletic department at my alma mater of 15 years, then I went to a place for the last five years as AD at a program that was really stressed and underperforming on every level. Then you come here and look around and you have some of the best coaches in their respective sports, some of the best people in their professions. If anything, how have I improved? That might be a Kirk Schulz question. When I met with the search firm in Dallas about a year ago at this time, and from the airport I called Gene Smith, the AD at Ohio State who’s mentor, friend and advisor and he asked how it went, and I said, I don’t know what it was, but I just felt a connection in that room. After being here a year, I kind of feel what they might have felt in me that it does fit. It’s nice being a part of something that if you’d told me 20 years ago that you’d end up AD in Pullman and my only connection then was rooting for them when they played Michigan in the Rose Bowl, I would have said no way that’s going to happen. It’s odd how things work out. We turned over 25 percent of the department, but the 75 percent that are still here – that’s a pretty amazing group of people. I’m even more motivated and more inspired by the group you work for, the student-athletes and the staff here. S-R: Any specific point when you felt you’re a Coug? Chun: Someone said, it’s not going to take a lot for them to accept you here – you just have to show you like the place. Whoever gave me that heads up was on point. If anything, it was probably on the road at Wyoming. Just because we took up like two sections behind our sideline, maybe three. And I’d grown up at a place where fans traveled to games. Then you’re at a mid-major where you can’t get people to come to home games. But winning that game and how we played and I love it when you go on the road and no matter how big or small your crowd is, you take over the stadium. And you saw that all throughout the year. That passion and pride for your institution is what I grew up in. The GameDay thing kind of took it over the top because no one else has done it like that before. I think that first road game, just because you start in January and it’s like a sprint to try and meet as many people as humanly possible and get your family here. It’s a sprint from February to the start of fall sports – the spring is just a blur and you know you’re not going to be in the office much because you have to see as many people as you can. Then going to that first game and seeing the pride people have and the excitement that was the moment, this is what I signed up for. Published: Feb. 9, 2019, 4:06 p.m.